These are the words of Jeff Halper, one of 191 Nobel Peace Prize nominees in 2006. Not only a sentiment of solidarity, this statement reflects the effects of Israeli military research on civil liberties in Canada, according to the Israeli academic and peace activist. 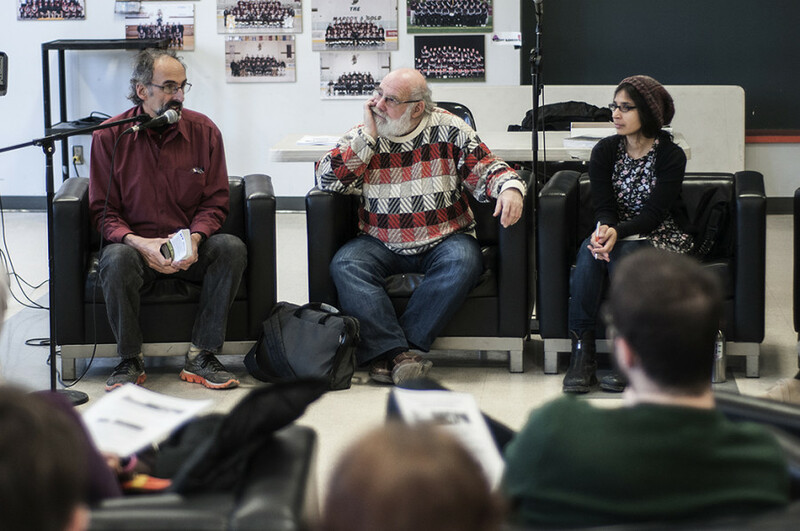 He led a discussion with students and professors at Concordia Monday afternoon. Universities like Concordia and McGill collaborate on projects like developing the weaponization of nanotechnology with Israeli schools such as Technion, the Israel Institution of Technology in Haifa, according to the Independent Jewish Voices of Canada. Halper claims Canada benefits when Israeli researchers use Palestinians as “guinea pigs” for its weapons and systems and their exportation. “Israel is involved in your prison systems. It’s involved in training the Royal Canadian Mounted Police. It’s involved in your airport security,” Halper said of Canada’s use of Israeli security tactics. As the director of the Israeli Committee Against House Demolition, he referred to how austerity measures in countries like Canada is leading to cuts everywhere except the military and police. Halper used the term “pacification” multiple times to describe the current political climate. Protests are becoming more controlled and nullified, according to the Israeli academic. When prompted by a Demilitarize McGill representative in the audience for advice about how to further their cause, Halper suggested asking professors involved in military research to cease operations, and, if they refuse, to publicly out them. During the Concordia Student Union by-elections last semester, students passed a referendum allowing the CSU to support the global Boycott, Divest and Sanction movement against Israel. The exact terms of how Concordia will enact BDS is yet to be determined, but Halper’s suggestions may be useful. Born in the U.S., Halper emigrated to Israel in 1973. As both countries pushed anti-Palestinian rhetoric, the activist credited his upbringing in the 1960s and non-belief in government propaganda for his critical thinking. While he made Israeli friends with similar opinions and co-founded ICAHD in Israel, Halper said that segregation from Palestinians means Israelis can live their lives in relative safety and a prosperous economy, without encountering a Palestinian or going to the West Bank.